Crisis pregnancy centers claim to offer advice and support to women conflicted about their pregnancies. But a new report sheds lights on just how misleading and dangerous the information these centers give out can be for women who are seeking genuine medical advice. A report released this week by NARAL Pro-Choice America details how Crisis Pregnancy Centers, or CPCs, masquerade as places where women can get information about abortion -- but offer no such services. Instead, the goal of CPCs is to persuade women to follow through with a pregnancy, regardless of what factors may have led a woman to seek termination. There are currently an estimated 2,500 CPCs in the U.S., compared to an estimated 1,700 abortion clinics. CPCs are well-known for targeting vulnerable or confused women with misleading ads, and providing them with false information. NARAL has gathered information on CPCs in more than 10 states. Investigators, posing as pregnant women, reported back on their experiences with CPC staff and the information given to them at these clinics, much of which was factually inaccurate. 1. In some parts of the country, CPCs outnumber abortion clinics by far. A whopping 95 percent of Minnesota counties do not have an abortion provider, but there are over 90 CPCs in the state. This means that crisis pregnancy centers outnumber abortion providers by almost 15 to 1. In North Carolina, CPCs outnumber abortion providers by 4 to 1. 2. CPCs often present themselves as legitimate reproductive health clinics. Many centers are purposefully located near abortion providers. Vague signage and websites lead some women to believe that these centers offer abortion services and contraception, when they do not. Women are told that they will be examined by licensed medical practitioners; instead, they are "counseled" by CPC staff, many of whom are not medically trained. In one example mentioned in the report, a CPC staff member performing a sonogram identified a women's IUD as her baby. 3. CPC staff regularly exaggerate the risks of abortion to terrify women into following through with their pregnancies. According to the NARAL report, undercover investigators were told by CPC staff that terminating a pregnancy would put them at significantly increased risk for breast cancer, infertility, the non-existent mental illness “post-abortion syndrome” and other health issues. All of these claims have been debunked by medical experts. 4. 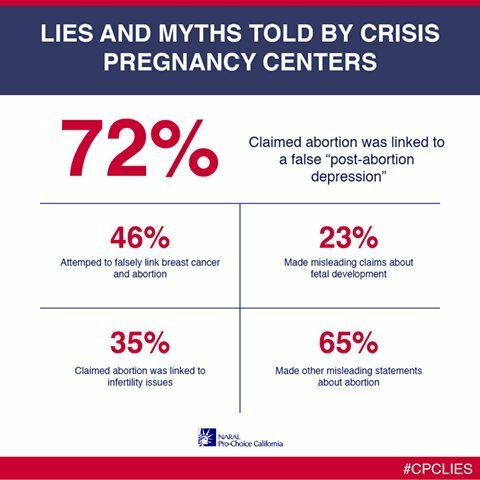 CPCs provide false information about birth control. Many CPCs have an anti-contraception bias. According to the report, "89 percent of CPCs investigated in Montana presented inaccurate information about birth control, including that birth control is the same as abortion, condoms don’t work, and birth control leads to breast and cervical cancer." Furthermore, 69 percent of Missouri CPCs investigated told women that hormonal birth control increases the risk of infertility -- and 92 percent refused to tell women where they could get access to contraception. 5. CPC staff often encourage women to delay making a decision about whether to have an abortion. Fifty-three percent of investigated Minnesota CPCs urged women to put off making a decision, by recommending that they take another pregnancy test in a month or undergo an ultrasound to see if the pregnancy is viable. One CPC volunteer in Maryland told an investigator: "Don’t panic. Abortion is legal through all nine months of pregnancy, so you have plenty of time to make a decision" -- something that is simply not true. 6. CPC staff regularly judge women for seeking legal abortion. Numerous investigators reported being shamed by CPC staff for their interest in termination. In North Carolina, 61 percent of investigated CPCs pressured women not to have abortions by giving them baby items. In New York City, 73 percent of CPC staffers investigated "referred to the fetus as a 'baby' or 'unborn child' and to abortion as 'killing.'" The NARAL report shows just how damaging CPCs can be for women who genuinely need help and reputable information about pregnancy, birth control and abortion. The conclusion of the report says it perfectly: "Women will never achieve reproductive freedom until all CPCs are exposed, and women are made aware of their rights and understand their medical options."